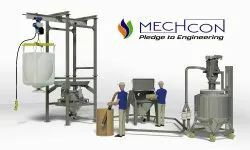 Mechcon provides solution for powder handling for Chemical, food and pharmaceutical Industries , catering services of powder transfer from bin to reactor/silos and various recieveing equipments. its dense phase vacuum conveying system. The PTS – Powder Transfer System offered by Mechcon Technologies is an exceptionally effective and reliable method of transferring and dispensing both dry and wet powders and granules. The maximum transfer distances are around 10 to 20 m overall and 5 to 8 m vertically.